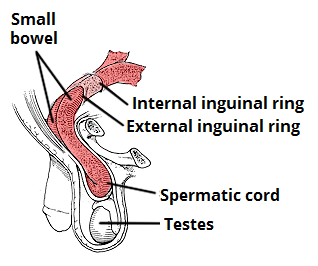 An inguinal hernia occurs when abdominal cavity contents enter into the inguinal canal. They are the most common type of hernia and account for around 75% of all anterior abdominal wall hernias, with a prevalence of 4% in those over 45 years. In this article, we shall look at the classification, clinical features and management of inguinal herniae. These two types of inguinal hernia can only be reliably differentiated at the time of surgery by identifying the inferior epigastric vessels – indirect hernias will be lateral to the vessels whilst direct hernias will be medial to the vessels. The most common presenting symptom is a lump in the groin, which (for reducible hernia) will initially disappear with minimal pressure or when the patient lies down. There may be mild to moderate discomfort which can worsen with activity or standing. If the hernia becomes incarcerated, it can become painful, tender, and erythematous. The patient may also present with clinical features of bowel obstruction if the bowel lumen becomes blocked, or with features of strangulation* if the blood supply becomes compromised. Theoretically, to differentiate a direct from an indirect inguinal hernia, the examiner must reduce the hernia and then place pressure over the deep inguinal ring (located at the mid-point of the inguinal ligament), before asking the patient to cough. If the hernia protrudes despite occlusion of the deep inguinal ring, this indicates a direct hernia. However, if the hernia does not protrude, this indicates an indirect hernia. However, this assessment is often seen as unreliable and the only definite method to differentiate them is at the time of surgery. There are several differential diagnoses for a lump in the groin. These include femoral hernia, saphena varix, inguinal lymphadenopathy, lipoma, groin abscess, or an internal iliac aneurysm. If the mass extends into the scrotum, consider a hydrocele, varicocele, or a testicular mass. A hernia is typically a clinical diagnosis and patients must undergo explorative surgery for further definitive diagnosis. Current Royal College of Surgeons Guidelines state that imaging should only be considered in patients if there is diagnostic uncertainty or to exclude other pathology. If necessary, an ultrasound scan is recommended as first line imaging. Any patient with a symptomatic inguinal hernia (significant mass or discomfort) should be offered surgical repair. However, a third of patients with an inguinal hernia will never experience any symptoms; these patients can be managed conservatively however importance should be placed on likelihood of future surgical intervention and symptoms of potential strangulation. The risk of strangulation is approximately 3% per year with an inguinal hernia. Any patients presenting with evidence of strangulation (e.g. pain out of proportion to clinical features) require urgent surgical exploration. Hernia repairs can be performed via open repair (Lichtenstein technique most commonly used) or laparoscopic repair (either total extraperitoneal (TEP) or transabdominal pre-peritoneal (TAPP)). Open mesh repairs are preferred for those with primary inguinal hernias and is deemed the most cost-effective technique in this patient group. They can be performed under general, spinal or local anaesthesia, dependent on patient fitness and surgeon preference. A laparoscopic approach is preferred* in those with bilateral or recurrent inguinal hernias. It can also be considered in certain patients with a primary unilateral hernia, mainly those at a high risk of chronic pain (young and active, previous chronic pain, or predominant symptom of pain) or in females (due to the increased risk of the presence of a femoral hernia). *Laparoscopic repairs are associated with longer operating times but quicker post-operative recovery, fewer complications, and less post-operative pain. A strangulated hernia is a surgical emergency, due to the time-dependent risk of bowel infarction. The diagnosis is typically a clinical one and requires urgent access to theatres for surgical exploration; due to the time critical nature of the condition, rarely will further imaging be requested. The specific management for strangulated hernia will vary depending on the type of hernia involved. Mortality is much higher in emergency cases compared to elective operations for all hernia. The main complications of an inguinal hernia are incarceration, strangulation, and obstruction. Where is a direct inguinal hernia located in relation to the inferior epigastric vessels? What is the definition of a incarcerated hernia? How is best to diagnose an inguinal hernia?